The Tonkinese cat breed was produced by crossing the Siamese breed with the Burmese breed, and one of the best things about Tonkinese cats is the blending of the features of these two great breeds into one cat. Burmese/Siamese matings were first seen in the 1930s. 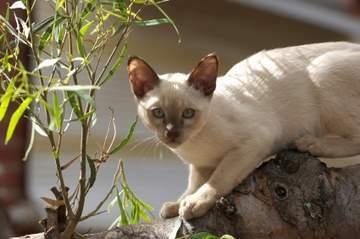 Wong Mau, a cat belonging to Joseph Thomson, a Burmese breeder, was a brown hybrid with a dark coat and darker points. Wong Mau was mated with a Siamese and this produced two distinct types of kittens; the first type was solid brown and the second type medium-brown with darker ears, face, feet and tail – both types of what we might today call Tonkinese - although of course they were not called that in the 1930s. The particular characteristics produced by this and similar crosses weren't developed at that time, and no further work was done with Burmese/Siamese hybrids until the 1960s. One of the first real Tonkinese cat breeders, Margaret Conroy, was a Canadian who along with two American breeders did an enormous amount to produce and promote the Tonkinese cat breed. She worked tirelessly to spread the word about Tonkinese cats, and the breed was first given recognition by the Canadian Cat Association in 1974. It was subsequently recognized by the Cat Fanciers' Association in 1978, with recognition by UK and Australian cat registries following in the 1980s. So what does a Tonkinese cat look like? As might be expected from cats with Siamese/Burmese parentage, the breed inherited the colored point pattern of their Siamese forebears and the darker coats and less angular faces of their Burmese ancestors. Tonkinese are medium-sized, muscular, heavy cats. Their body type is Oriental but generally less extreme than the modern-day 'wedge' Siamese; they are rounder than Siamese cats and their faces tend more towards the Burmese than the Siamese, squarer and less triangular than modern Siamese cats. Their coats are short, sleek, feel silky to the touch and have a sheen to them. Their eyes are blue-green or greeny-blue (there is a difference!) and have been described as aquamarine or turquoise. For anyone used to the Siamese breed, one thing to note about Tonkinese cats is that the colors are named differently to Siamese point colors. The cat registries all have slightly varying rules – the following are those of the Cat Fanciers' Association. 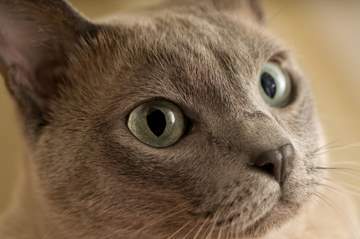 There are three varieties of the Tonkinese cat breed – Mink, Solid, and Pointed. Each variety comes in the range of colors shown lower down. In the Mink variety, the coat should be rich, even and unmarked, slightly lighter on the underside. There should be some contrast between the body color and the points. Mink colors should have aquamarine-colored eyes. In the Solid variety there is less contrast than in the Mink – the body and point colors are similar to each other. Solids have green or yellowy-green eyes. In the Pointed variety the body color should be off-white (more like the Siamese) and there is marked contrast with the points. The eye color is bluey-green. Some cat registries also accept Honey, which has a warm reddish-brown coat color and chocolate points. The colors above are (roughly) equivalent to the UK's GCCF colors of brown, blue, chocolate, lilac and red. Tonkinese cats combine the loving nature of the Burmese with the lively, curious and mischievous character of the Siamese. The Tonkinese cat breed loves activity and adventure; a Tonkinese will stick his nose into everything, whether you want him to or not! They love heights and are most definitely 'shoulder cats' – the higher they can climb, the more they enjoy it! These cats are extremely loving and adore company and cuddles - the best way to care for a 'Tonk' is to provide him with plenty of company, both feline and human. They are not quite as demanding as their Siamese cousins and their voices are not quite as loud! Thinking of buying a Tonkinese cat? If you're thinking of getting a Tonkinese, it's important to know that they love companionship, mix well with other animals and don't like being left alone. Because of this they're probably better off living with families where there is plenty of daylong activity, rather than with single owners who may be out at work all day.